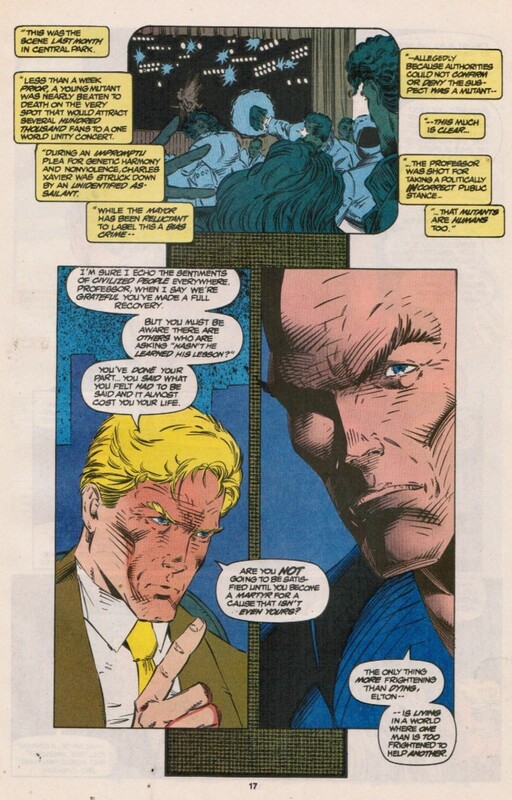 I will never not despise that "Professor X was really David Xanatos" turn. I never got into "Gargoyles," though I probably should. "Professor X was really David Xanatos" makes me wonder if Jonathan Frakes should voice Xavier if they ever do another X-Men cartoon. I think Frakes would make a better Mr. Sinister than Xavier. "IT'S ALIVE! ALIVE! ...I always wanted to say that." "It's my first real stab at cliched villany. How am I doing?" "Nothing terrifies me. Because nothing is beyond my ability to change." Let's be fair, not all of them were dramatic retcons. Charles could always be a bit of a jackass. Like in Kitty's first appearance, there's a scene where the Prof is treating the team like a bunch of teenagers, telling Scot Wolverine's earned demerits for not wanting to be treated like an inexperienced teenager. And when Scott points out that, hey, this is a team of mostly professional adults who know what they're doing, the Prof just goes "you're right, Scott, that IS your fault, but don't worry, I'm going to fix it." There's "being a bit of a jackass", and the examples for Charles are many and varied, and then there's "recruiting a whole team of X-Men, in secret, including Scott's long lost brother, getting them killed and then mindwiping everyone to hide his mistakes"
The problem was that multiple writers all wanted to be the one to counter the "Saintly Xavier" stereotype that had popped up in the X-books. So each one wrote some horrible sin Xavier had committed, because surely we could forgive such a benevolent person a single bad deed right? But when you stack them on top of each other, you pretty much completely alter the character. Before his death during AvX Charles had now covered up the deaths of innocent people (deaths he was ultimately responsible for), consigned a developing AI into seemingly-eternal servitude, conspired with others to secretly influence the world, and spent his nights devising ways to murder his students. Things had gone way beyond "jackass." Hell, they even devoted a mini-series trying to retcon some of this stuff to make it seem less horrible. That was revealed in EXCALIBUR during "Onslaught" right? 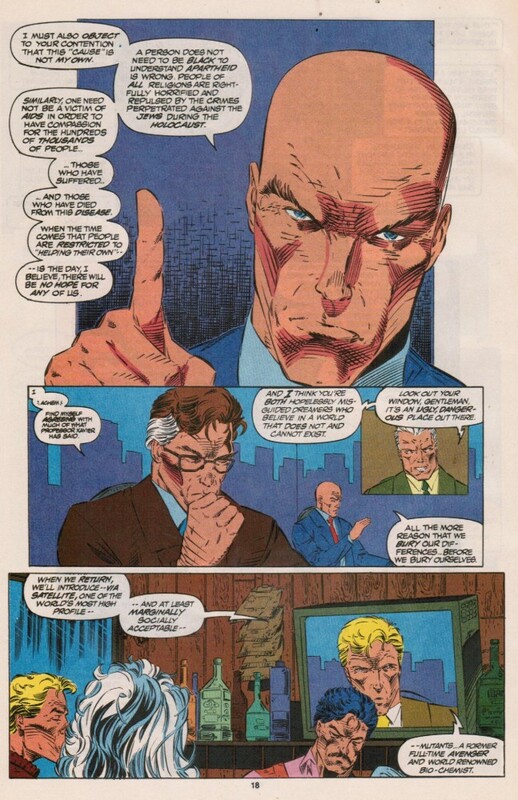 The Xavier Protocols were "Xavier would stay up nights coming up with ways to kill the X-Men if needed." Warren Ellis wrote those issues. As opposed to all those times where he just caused ways of killing them by accident. Exactly. If it were just Cerebra or just the Xavier Protocols or even just the lost X-Men, that would work for the narrative. But when go Lost X-Men AND Cerebra AND Protocols, you go from "Hero with a dark secret" to "super villain." This is pretty much 100% correct. I guess death was always fated for Xavier hopefully permanent. Seems the writers were fresh out of ideas about his character. I would hope writers could give him a better ultimate fate that "Macguffin that lets Red Skull do whatever the plot calls for." Xavier's character was drown in too much mud any sympathy I had for him was quickly turned to "meh". Besides he became a joke after he conceded defeat by telling Erik his dream was the right path. Which part of X-Treme X-Men was that? Schism? Another storyline? It was part of the initial plot of X-Treme X-Men. The team was looking for Destiny's diaries, but wouldn't trust Charles with them because he was so fundamentally untrustworthy. At the end of it they talk with Charles and treat him like he's the Worst Person Ever, because... reasons?